Have you noticed The Reading Hour Countdown widget in my right sidebar? Tomorrow, August 25 2012, is The Reading Hour in Australia! What a great culmination to Children's Book Week! At the website, The Reading Hour, you'll find details of lots of great events, as well as the results of contests held to celebrate the National Year of Reading. The Love2Read wiki has all sorts of posters and ideas you can use too. *How many books can you and a friend or parent read together in one hour? *How many pages can you read in one hour? *How many words can you read in one hour? Rather than counting each page individually, see if you can figure out a quicker way to estimate the number of words you've read. *What's the smallest space you can find to read in during The Reading Hour? The Book Chook likes to read under the dining table with a blanket over it to make a cosy cubby. *What's the darkest safe space you can find to read in during The Reading Hour? You might need a torch for this one. *What's the most unusual place you can find to read in during The Reading Hour? The Book Chook is planning on someplace tall and leafy. Shhh…it's a secret! *What's the strangest costume you can wear for reading during the Reading Hour? The Book Chook's special outfit for tomorrow involves flippers, a saucepan for a hat, and …but shhh… that's a secret too! *Where do you wish you could read to celebrate The Reading Hour? 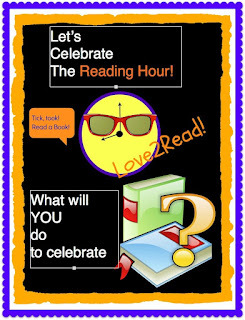 *What challenges can you create for other kids/classes to help them celebrate The Reading Hour? ***How will YOU celebrate The Reading Hour? Me and the kids read TWELVE picture books. Doesn't seem like a lot in an hour, does it? We LOVED it. The kids want to do it every night! @Tania McCartneyAw, go on, Mum, you know you want to!